Feast Portland 2017 – the best yet? For the sixth year, Partners for a Hunger-Free Oregon acted as the charitable beneficiary for Feast Portland 2017. Over the years, Feast Portland has raised more than $300,000 to help end child hunger. Their support is not just financial though; the festival offers us the ability to reach thousands of people through our presence at the events and media. The festival started with the Sandwich Invitational on Thursday, September 15. We handed out tokens, touted our giveaway basket and talked to people about hunger in Oregon. The event was packed to the gills with amazing sandwiches and even more awesome people. It was truly a smackdown with an amazing hot Nashville Chicken sandwich from Lardo winning as the night’s favorite. Next was the first day at Oregon Bounty Grand Tasting, the big event at Pioneer Courthouse Square. There were incredible bites and drinks from all over. Some of our favorites included southern bacon biscuits with apple jelly and blue corn grits from Congaree and Penn Farm & Mills, blackberry-coconut pops from Honey Mama’s and masala chai from Steven Smith Teamakers. 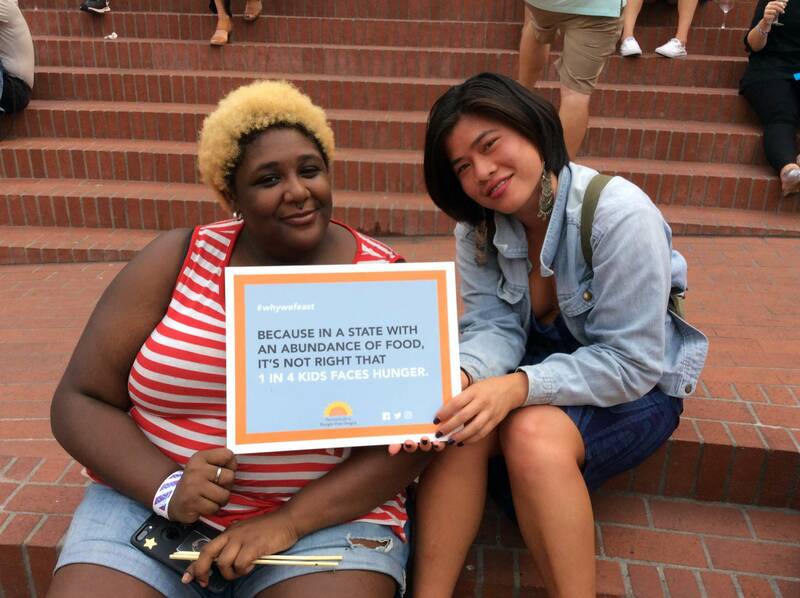 At both days of the event, we talked to tons of people, gave out goodies and so many people told us #WhyWeFeast! Friday night brought Night Market on the picturesque south Waterfront. The event featured amazing cocktails, lovely Latin-inspired food and fantastic music. We loved the tuna tostada from Newport’s own Local Ocean Grill + Fish Market and mouth-watering crab rangoons from Olmsted. We ventured out in the crowd, chowed down and thanked attendees for contributing to us just by buying a ticket to Feast! After a long day at the Grand Tasting, we prepared ourselves for the best barbecue and headed out to Smoked! It was a neon-lit Saturday night and we were there to thank Feasters and tell them about our work to end childhood hunger in Oregon. The weekend ended with Brunch Village. We were sad to say goodbye, but enthusiastic about celebrating what is arguably the best meal. Between the over-the-top food and the interactions we had with those at the event, it was a wonderful way to cap off the weekend. We would like to thank Feast Portland and all the attendees of the event for your support of our work. It would not be possible without you! Check out our photos from Feast and tag yourself! Pizza on Earth 2017 was a success! Congratulations 2017 Summer Meals Support Fund Recipients!